It’s been 50 years since a spectacular UFO was spotted over Exeter. That case, along with many others, remains unsolved. This rarely seen photo shows the open landing site and Betty Hill pointing her finger in the direction the craft exited. It was taken in the early ’70s by John Oswald who became Betty’s driver after Barney died in 1969. Another shot of Betty Hill at the reported abduction site. 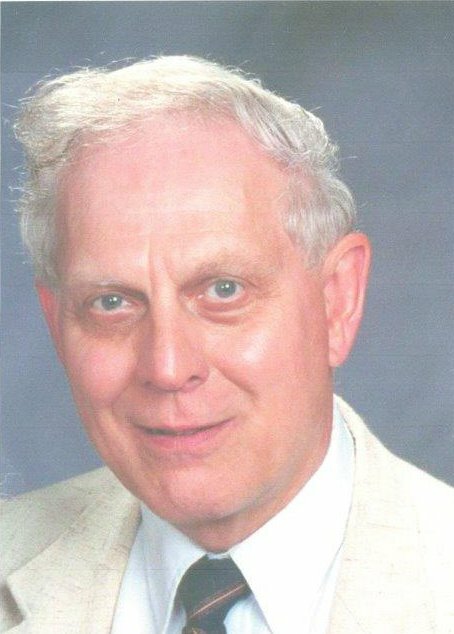 Raymond Fowler as a young investigator around the time of the Incident at Exeter. A recent photo of Raymond Fowler. Dean Merchant commissioned local artist Roseann Meserve to place Officer Gene Bertrand and Norman Muscarello under the intense red light at the farm site in Kensington. This imaginary portrait of Exeter as a UFO capital was created by Eli Segal. 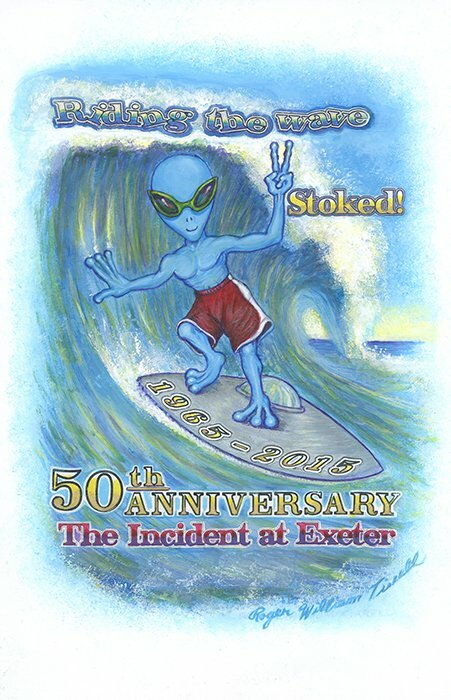 This is an image that Dean Merchant dreamed up to commemorate the 50th anniversary of the Exeter Incident. Artist Roger Tirrell brought the image to life. Fifty years ago this September, UFOs came to Exeter. They haven’t left. The history of unidentified flying objects in the skies of New Hampshire is long, varied and weird. It includes two hugely celebrated cases that caught the popular imagination and served as harbingers of hundreds of other encounters occurring across the decades and around the globe. 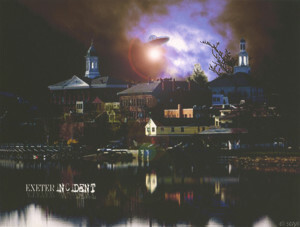 New Hampshire sightings have attracted the attention of journalists, true believers, skeptics, schoolchildren, movie producers and conspiracy theorists. They have even inspired an annual festival in Exeter that brings together some of the biggest names in the field of UFO studies. I’ve certainly been influenced by Granite State UFOs. I’ve seen one myself. It was a clear summer night in the early ’80s. I was hanging out with two friends, Ken and Tom, at Odiorne State Park in Rye, when one of them pointed to a bright, white light over the bathhouse. It seemed like nothing more than a beacon to keep nighttime visitors from stubbing their toes. And then it suddenly dimmed. And moved. Silently. In a fashion unlike any kind of vehicle we’d ever heard of. It rose above the bathhouse and danced in strange patterns. Then it turned, flew higher and headed out to sea and out of sight. From the Dinnerhorn Restaurant back in Portsmouth, Ken called Pease Air Force Base and reported what we had seen. The person on the telephone took the information, said someone would be in touch if they had any questions. Nobody ever made any further inquiries. As sightings go, mine is not outstanding. It was not frightening, merely weird and mysterious. It was definitely a UFO, literally a flying object we could not identify. The photo illustrations by photographer (and likely brain-fogged abductee) David Mendelsohn were not intended to accurately portray the famous “incidents” described in this story. To get that, pick up John Fuller’s books. 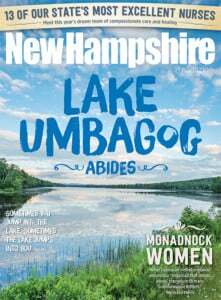 Mendelsohn set out instead to capture the mythic qualities of these bits of NH history in the manner of great movie poster art. We expect to hear from sticklers, but we’re delighted with the results of his creative labors. Plenty of people assisted. Here’s a roster: Top photo: Tom Shulte and Pedro Pimentel as Bertrand and Muscarello. Wardrobe by Ann Carnaby of Tracy Theatre Originals. Assistance by Wendy Mendelsohn, Ryan Rogers and Rick Broussard. Below: Gabe Price, Shelly Hudson as Betty and Barney. Wardrobe by Ann Carnaby of Tracy Theatre Originals. Car loaned by Dan Gautreau of Gautreau’s Auto Restoration, hair and makeup by Loretta Tower. Assistance by Wendy Mendelsohn and Zoe Cacavas. A minor sighting. 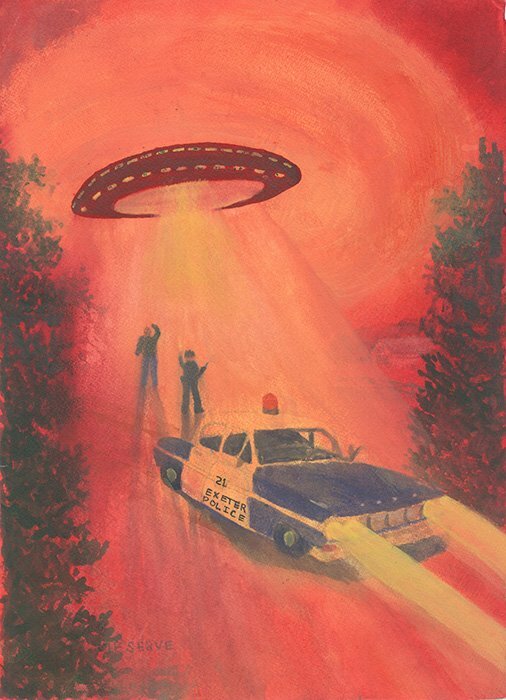 But one that fits neatly into the pattern of great New Hampshire UFO stories. The first great New Hampshire UFO sighting, the so-called Exeter Incident, began in the early morning of September 3, 1965. Muscarello claimed that this “Thing,” an airborne object as “big or bigger than a house,” came at him and hovered silently above him. Red lights pulsed around its rim as it floated, yawed and wobbled. Afraid he was about to be hit, the teenager dove for the road’s shoulder and watched as the object moved to hover over the roof of a nearby house. Muscarello ran to the home and banged on the door, getting no answer. He went back to the road and flagged down a passing automobile, which took him to Exeter. After listening to Muscarello’s story, Toland called Patrolman Eugene Bertrand, who revealed that he, too, had heard about flying objects that evening. Hours before, Bertrand had come across a car parked on the Rte. 101 bypass. The female driver said that a “huge, silent airborne object” had trailed her from Epping. She, too, mentioned flashing red lights. The object moved erratically, darting back and forth, turning sharply and decelerating quickly. At this point, Exeter Patrolman David Hunt arrived, and he witnessed the object as it moved out of sight and headed toward Hampton and the ocean. At 3 a.m., an upset man in a Hampton tollbooth called the Exeter police. He hung up before he could give many details about what he had seen. Patrolman Toland in Exeter called the Hampton police, and they in turn alerted Pease Air Force Base in Portsmouth. The official investigation was underway. It’s thanks to the efforts of journalist, filmmaker and television producer/director John G. Fuller that the Exeter Incident has become such an integral part of UFO history. 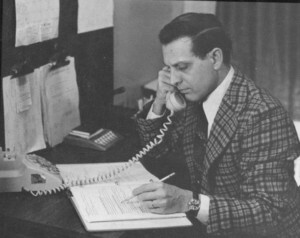 Eleven days later, while looking for fodder for his Saturday Review column, Fuller examined a clip from the New York Times about authorities in Texas, New Mexico, Oklahoma and Kansas being “deluged” by reports of unidentified objects flying in the sky. A call to the National Investigations Committee on Aerial Phenomena (NICAP) in Washington put him touch with Assistant Director Richard Hall, who mentioned what had gone on in Exeter a little over a week before. Fuller’s first article about UFOs appeared in his “Trade Winds” column for Saturday Review. The story was expanded into a feature for Look magazine, then condensed for Reader’s Digest. Eventually, Fuller journeyed to Exeter to interview the various participants and commentators. The tale was turned into the book, “Incident at Exeter,” published in 1966. Betty and Barney Hill’s mysterious event had occurred four years earlier, on September 19, 1961. He, a Postal Service employee and she, a social worker, the Hills were coming home from Canada when they stopped at a restaurant in Colebrook. When they left, they noted that the clock over the restroom read 10:05. On Rte. 3 in Groveton, Betty spotted a strange light in sky, and Barney brought out a pair of binoculars. The object looked like “a huge pancake.” The oddest part, however, was a band of light around the base. Through his binoculars, Barney spotted a “row of structural windows,” and saw within them what he took to be bipedal crew members. The Hills made it home to Portsmouth. They didn’t come busting into a police station like Norman Muscarello. But they arrived two hours later than they thought they should have, with no recollection of the intervening time. Ten days after the sighting, Betty began having vivid dreams for five successive nights. Barney didn’t mention any dreams, but the weeks went by and he had difficulty sleeping. Dealing with a number of health problems, he eventually consulted a psychiatrist, who referred him and Betty to Dr. Benjamin Simon in Boston. Although he claimed to be neutral on the issue of UFOs, Simon planned to use hypnosis to pierce the walls of their amnesia regarding those missing two hours. What the Hills revealed to Simon was what would become the classic alien abduction scenario, complete with strange exams and probes of their reproductive organs, administered by big-headed, big-eyed, non-human life forms. Under hypnosis, the Hills related further details recovered from their “lost” time, including entering the craft, meeting the visitors and being medically examined. Betty also drew a “star map” that supposedly showed the routes the visitors followed during their peregrinations around the galaxy. Nevertheless, in November 1963, the Hills spoke with an amateur UFO study group about their experience, and an allegedly unauthorized audiotape eventually made its way to John H. Luttrell, a newspaper reporter for the Boston Traveler. On October 15, 1965, the front page of the Traveler sported the headline “UFO Chiller: Did THEY Seize Couple?” and the Hills’ not-so-secret tale was out. The story captured the nation’s imagination, and Fuller’s 1966 book only lent it more notoriety. “The Interrupted Journey” became a 1975 TV movie, “The UFO Incident,” starring James Earl Jones as Barney Hill and Estelle Parsons as Betty. Barney died of a stroke in 1968, and Betty passed away in 2004 at age 85. 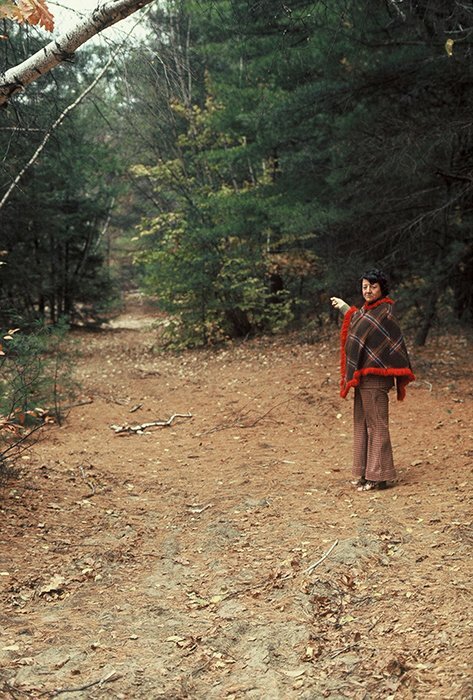 This rare photo of Betty Hill at the site of her reported abduction was taken by NICAP investigator John Paul Oswald, who became Betty’s driver after Barney’s death in 1969, later accompanying her on many UFO expeditions. 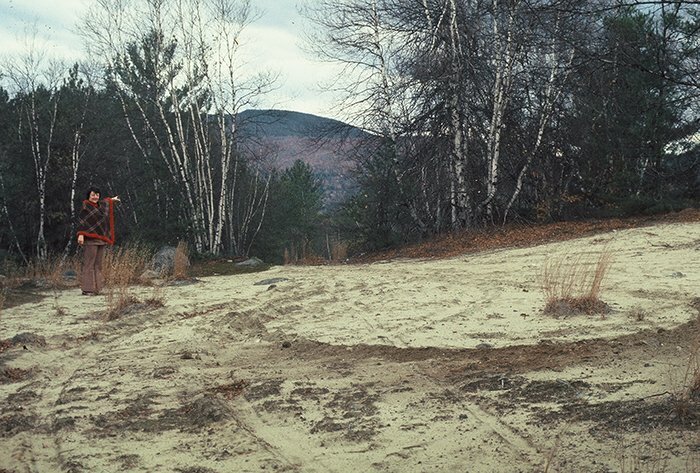 What are we supposed to make of New Hampshire’s UFOlogical legacy? Are they craft piloted by beings from other planets? Are they the result of atmospheric phenomena? Could they be terrestrial aircraft mistaken for something otherworldly? Are they the products of mass delusion? Paranormal investigator Joe Nickell is the “Investigative Files” writer for Skeptical Inquirer science magazine. In 2011, he and James McGaha, an astronomer and former military pilot, combined their expertise to construct a solution to the mystery at Exeter. In a special report for the November/December edition of the Skeptical Inquirer, they focused their attention on the five red lights that Muscarello had reported flashing in sequence. On September 5 and 6, 2015, half a century after the original Incident, virtually anyone who comes to Exeter is likely to see an extraterrestrial, at least one that’s day-glo green, inflatable and decorating the town bandstand. The Exeter Area Kiwanis Club will once again host the Exeter UFO Festival as a fundraiser for the organization’s charitable programs. The festival was founded by freelance journalist, UFO enthusiast and Stratham resident Dean Merchant and his wife Pamela [See “Meet Mr. UFO”]. They and the Kiwanis members have worked to create an event that appeals to both serious flying saucer investigators and families with young children seeking some low-cost Labor Day Weekend fun. In the past, the event was free to all comers, but this year programs in the town hall will require the purchase of a general admission button for a nominal fee. In years past, up to 500 spectators have packed themselves into the historic town hall, where Abraham Lincoln gave a speech in 1860. The list of scheduled speakers is weighted heavily toward individuals fascinated by UFO mysteries and convinced of the existence of extraterrestrial visitors. Stanton Friedman and Kathleen Marden will attend. Richard Dolan, author of “UFOs for the 21st Century Mind” will speak about “The Geopolitics of the UFO Cover-up.” Along with John Oswald, one of the original NICAP investigators, Merchant will give a talk about The Incident at Exeter. Meanwhile, at Founder’s Park, young children will be able to explore a “Crash Site” littered with “debris” suitable for arts and crafts projects (essentially a DIY UFO kit). The Exeter UFO Festival does sound like a fun time, but after “ET,” “X-Files” and “alien autopsies,” can disbelief in extraterrestrials be willfully suspended anymore? Can the mystery and awe of the unknown still conquer 21st century skepticism? It’s tough, but achievable. As for my own close encounter at Odiorne Point, I’m glad I saw it, whatever it was, whether of terrestrial, interdimensional or extraterrestrial origin. I have no theories about its purpose, sinister or otherwise. The memory connects me to the mysteries of the cosmos. And it reminds me of my youth in my NH hometown. Fair enough. Whatever I saw that night at the beach, I’m pretty sure it wasn’t manufactured in the Granite State. Dean Merchant and Molly, his “UFO dog,” take a break between adventures. Dean Merchant of Exeter likes to describe himself as a research historian-journalist-adventurer, which makes him a sort of Indiana Jones of UFOlogy. In his mundane life, he and his wife, Pam, are what he calls “old New England,” i.e. they’ve made a living doing everything from antiquing to lobster fishing to running an eBay store. Merchant is also a long-time Democratic political operative and occasional office holder. Since he and Pam created the Exeter UFO Festival in 2009, people tend to tend to call him “the UFO guy,” he admits. He relishes the role and even asked an artist friend to make him a plaque, reading “UFO Stories Wanted,” to set out when he’s sitting in one of his favorite coffee shops. He’s accumulated quite a few stories, but ironically has never seen a definitive UFO himself. The 509th is a particularly intriguing factor to Merchant, since it made history on August 6, 1945, when the 509th’s B-29 “Enola Gay” dropped the first atomic bomb on Hiroshima. Later, they were moved to an obscure air base in an even more obscure New Mexico town named Roswell. Then in 1958, the 509th relocated its planes and personnel to Pease Air Force Base within view of the open fields of Exeter. Merchant, who also has “freelance writer” on his jack-of-all-trades business card, is currently working on a book titled “They Flew East” that he says will reveal the connections between Roswell, Exeter and the Betty and Barney Hill story (hint: some think that the Hills were victims of what’s known in conspiracy circles as a MILAB, or joint alien/military abduction). The festival he helped create has gone through a number of changes recently and he’s taking a more subdued role, but he will be speaking at the Stratham Public Library on Thursday, Sept. 3 (the actual anniversary date of Exeter’s famous close encounter), offering a free talk titled “Inside the Incident at Exeter.” Thomas Muscarello, younger brother of Exeter UFO witness-in-chief Norman, will be there to take questions. And during the festival, Merchant will be out standing in his field, literally. Attendees will be invited to the spot on Rte. 150 in Kensington (aka UFO Alley) where Muscarello and Bertrand originally got a close-up look at whatever it was hovering over the treeline. Merchant and some other experts (including John Oswald, who took the photo of the “artifact” pictured on this page) will be there to give talks on the half-hour between noon and 2 p.m. It might be a little early in the day for a UFO sighting to take place, but one can hope. After all, nearby Shaws Hill, according to Merchant and others, has so many encounters it might be the site of a UFO “window” or star gate. This blob of metallic material was discovered at the scene of the Hill’s abduction site in Thornton. It’s currently in the possession of a person who wishes to remain anonymous out of fear that government interests might take the object. Merchant, who has held the artifact, says from its smooth top surface and mottled underside suggests it melted and dripped off of something hovering over the abduction site, then landed and cooled in the glacial sands near where the Hill’s car stopped. The photo is by John Paul Oswald, who was there when it was found during an interview with Betty Hill filmed by Nippon TV at the abduction site. The photo of the artifact will be on display at this year’s Exeter UFO Festival. 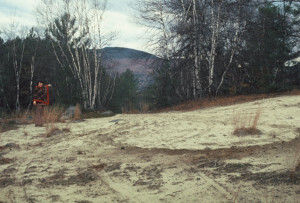 The Betty and Barney Hill Collection, Milne Special Collections, UNH, Durham has original source materials, a display of Betty’s torn and stained dress with the pink powder that saturated areas of it during her alien encounter. More here. Novelist John G. Fuller, manuscripts and collection at Howard Gotlieb Archival Research Center, Boston University, Boston has interesting stuff like Dr. Benjamin Simon’s notes scrawled on the original Fuller manuscript of Betty Hill’s book. Call ahead to have the materials ready for you. Seacoast Saucers of New England, in Stratham, has social saucer meet-ups the second Friday of every month at 7 p.m. and encounter gatherings the first Saturday of each month at 4 p.m. Discuss UFOs or alien abductions and share personal experiences in a friendly group atmosphere online or at Seacoast Saucers of NE on Facebook. It was Ray's NICAP report that became the centerpiece for the 1966 Congressional hearings on UFOs. They were both open to the public and the only such hearings Congress ever had. The hearings came about when a lot of UFO activity was taking place in Michigan. The Air Force kind of browbeat Dr. Allen Hynek into telling the press it was swamp gas. The outcry from the public reached the ears of Congressman Gerald Ford of Michigan. Ford called for the hearings and they fell under the auspices of the Armed Services Committee chaired by then Congressman Don Rumsfeld. It was at these hearings that the Air Force admitted they could not solve the Exeter case and apologized to the two Exeter policeman for how they had been treated in regards to the Incident. Policeman Gene Bertrand had nine years of experience in the Air Force and knew all the types of craft and was involved in refueling them – He knew he had seen something not of this Earth. It was Ray's report and copious notes that were turned over to John Fuller to become the foundation for his bestseller the “Incident at Exeter,” which went on to sell over a half million copies and brought ufology into mainstream America. I see Fuller's hardcover book for sale on Ebay for $30-$35 dollars. Ray's first book that came out in 1974, "Interplanetary Visitors," will sell for as much as $125. His second book, "Casebook of a UFO Investigator," also mentions Exeter. Ray's books on the Betty Andreasson abductions also broke new ground by bringing alien implants into the public discussion for the first time. His book on the Allagash Abductions in Maine remains a classic within the field. While Ray does not appear on TV these days nor do UFO conferences, he teaches courses each semester through Kennebunk Continuing Education and at times teaches one on ufology. Ray also wrote the investigator’s book for MUFON where he was once the international director of the organization. He was a companion of and a part of Dr. Allen Hynek's CUFOS organization as well. Ray is the crème de la crème of UFO investigators and non-pariel in the field. He still is one top respected authorities on the subject along with Dr. Jacque Vallee and Dr. Allen Hynek. Dean Merchant with debris from the 1959 crash of a B52 bomber in the Spruce Swamp.